Planning is moving ahead for Phase 2 of the Managed Shoreline Retreat project at Surfers' Point. The Surfers' Point Managed Shoreline Retreat project is one of the first managed retreat projects to be implemented in California. 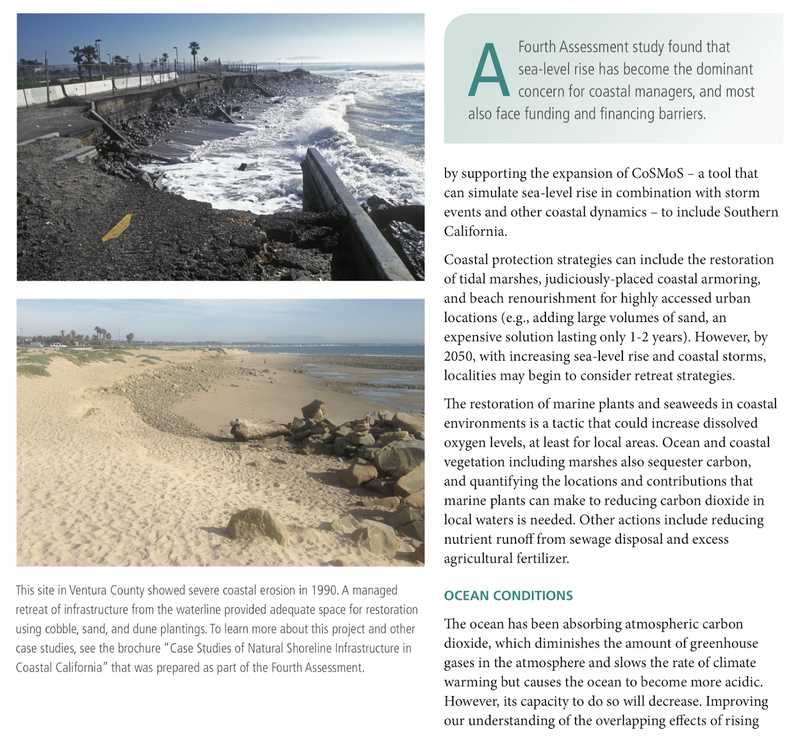 Developed in response to coastal erosion, it serves as a model of sustainable shoreline management for other similar projects up and down the California coast. Funding limitations in 2009 necessitated a phased approach to construction, with the first phase completed in July 2011. Phase 1 included relocation of the bike path and parking lot landward and construction of a man-made cobble berm to stabilize the shoreline. In 2012 sand dunes were constructed on top of the berm using sand imported from nearby Pierpont beach, and seeded with native dune plants. Dune restoration and maintenance has been supported through ongoing volunteer work days. leaving it vulnerable to coming winter swells. Phase 2 will address this problem. Although Phase 1 has demonstrated the effectiveness of the managed retreat approach, only approximately half of the threatened shoreline infrastructure has been relocated. Additionally, several features of the project remain outstanding or require modification as a result of lessons learned. This work will result in a "shovel ready" project that will be eligible for grant funding to complete construction and implementation. This project is a perfect candidate for the recent Proposition 68, Parks, Environment, and Water Bond passed by California voters in June 2018. The Surfers' Point Working Group met on October 9, 2018. The consultant team presented initial concept drawings and renditions of the project. 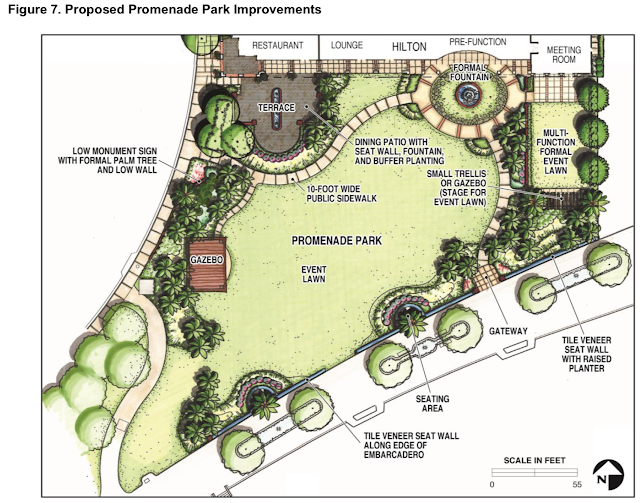 The main concerns with Phase 1 are the parking and stormwater runoff system, as well as fencing and gates, lighting and landscaping. Some initial options were presented for all of these items. Design options are also being considered to relocate the remaining bike path and parking lot further inland on Fairgrounds property, out of harms way. 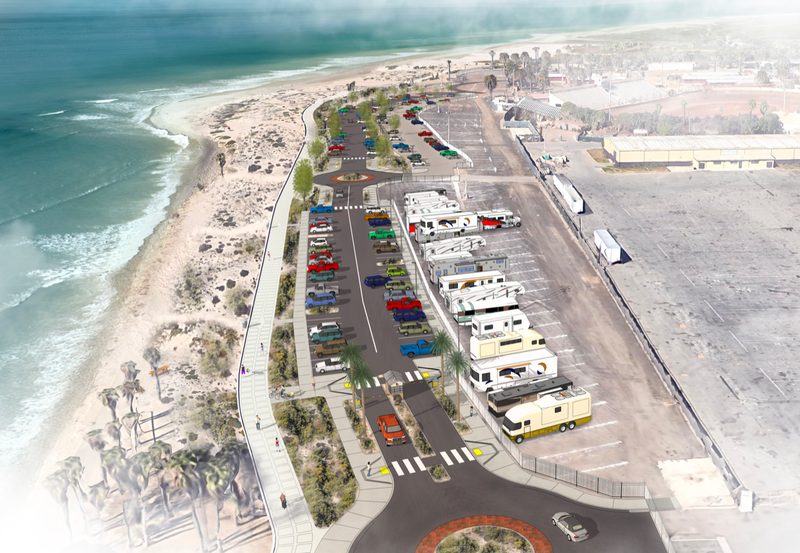 The initial concept presented for this "Phase 2" area involves widening Shoreline Drive to provide space for the relocated parking lot and bike path. A similar beach restoration strategy as used in Phase 1, a cobble berm and sandy beach/dune area, would be constructed to provide long term protection for the new bike path. Surfers Point Phase 2 - aerial rendition of initial "Concept A"
In this proposal the City would dedicate Shoreline Drive to the Fairgrounds to provide for relocated parking. The layout of the parking areas and potential improvements are shown below. Utilizing Shoreline Drive in this manner provides the potential for an increase in parking from what exists today. Note that these are very preliminary concepts and will change based on input from the working group. Thousands of residents live in homes protected by a levee that stretches 2.65 miles along the Ventura River, between the Pacific Ocean and Shell Road. In the more than 3,500 residential, commercial and industrial structures lie an estimated $2.157 billion worth of infrastructure and property, according to studies prepared for the Ventura County government. Experts with the U.S. Army Corps of Engineers say that without rehabilitation, it’s likely the levee could in time breach or collapse entirely. When the initial levee was built in 1948, one thing not considered was the loss of sediment likely to result from construction of Matilija Dam, which had been installed on a major tributary only the year before, the corps noted. 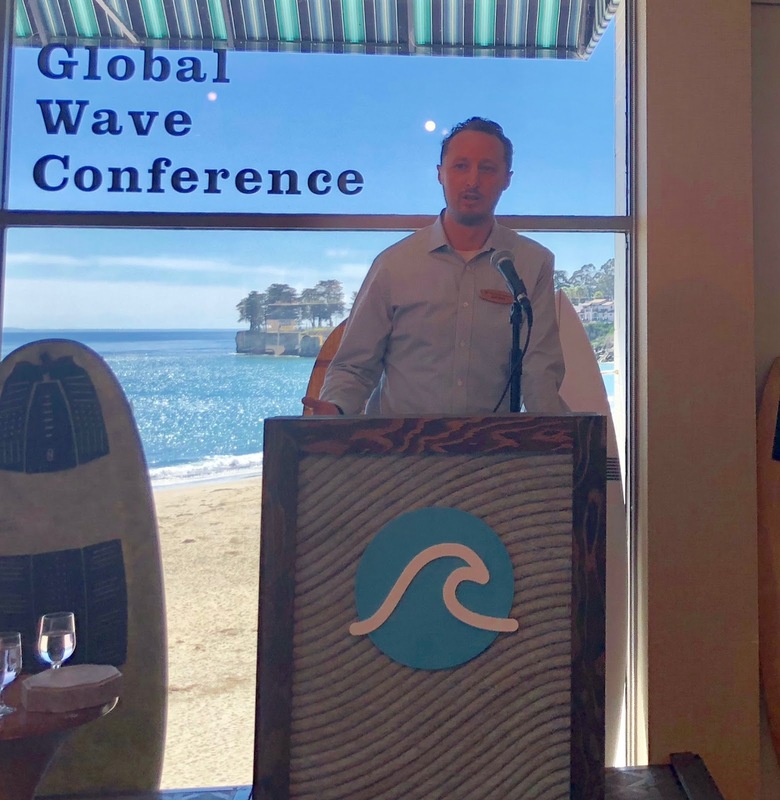 “Basically, the foundation of the levee is higher than the potential bottom of the river,” said Paul Jenkin, Ventura County campaign coordinator for the Surfrider Foundation. That means in a flood or high-rain event, the river could flow under the base of the levee, causing it to fail. The change has been notable. Initially, the levee was made with 8 feet of toedown, which means rocks extended that far below where the riverbed meets the base of the levee. Today, there is “minimal to no toedown protection,” the corps noted. Poorly understood at the time the dam was built, these are the long-term costs of a sediment starved river. 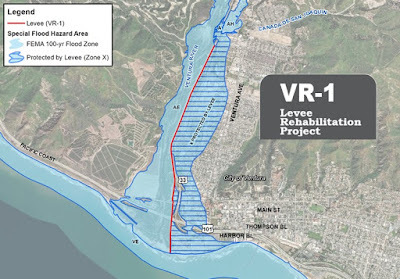 Although the $25 million Ventura River Levee VR-1 project is not included as part of the Matilija Dam ecosystem restoration project, three other levees are. The bulk of the planning and removal costs of dam removal involve the replacement, upgrade, or new infrastructure downstream of the dam to accommodate the restoration of the Ventura River's natural sediment transport. 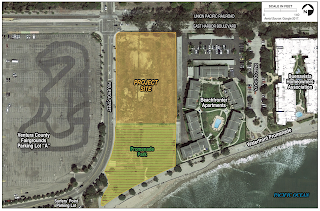 The City of Ventura has circulated notice of an MND (Mitigated Negative Declaration) for the hotel project on the corner of Figueroa and the Shoreline Drive across from the fairgrounds entrance at Surfers' Point. Originally Embassy Suites, this is now a Hilton hotel. During a 100-year storm event, waves running up through the Park could enter the first floor of the hotel, potentially breaking through the south facing doors and windows, damaging facilities and potentially endangering hotel guests and workers. 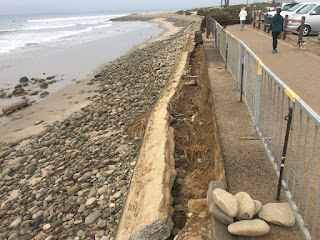 Even under current climatic conditions, this type of damage is not unprecedented; for example, recent damage to the Ventura Promenade immediately upcoast where the Promenade was undercut, and planters and seat walls were destroyed by wave attack during the severe 2015-2016 El Niño, requiring emergency rock revetment installation. the first-floor uses are limited to retail, parking, restaurant, lobby, and meeting rooms, not hotel rooms for overnight occupation, which may be subject to coastal flooding damage and threats to life and property. As discussed further below, future conditions under increased sea level conditions may exacerbate coastal flooding and wave run-up impacts. Mitigation measures identified below would reduce the risk of structural damage, injury, or death associated with 100-year storm events, making impacts less than significant with mitigation. Suggested mitigation for this scenario include structural reinforcement, elevation of utilities, and worker evacuation training. In 2009 Surfrider commented that the City collect fees on coastal development to ensure funding to maintain and repair the promenade and seawall into the future. 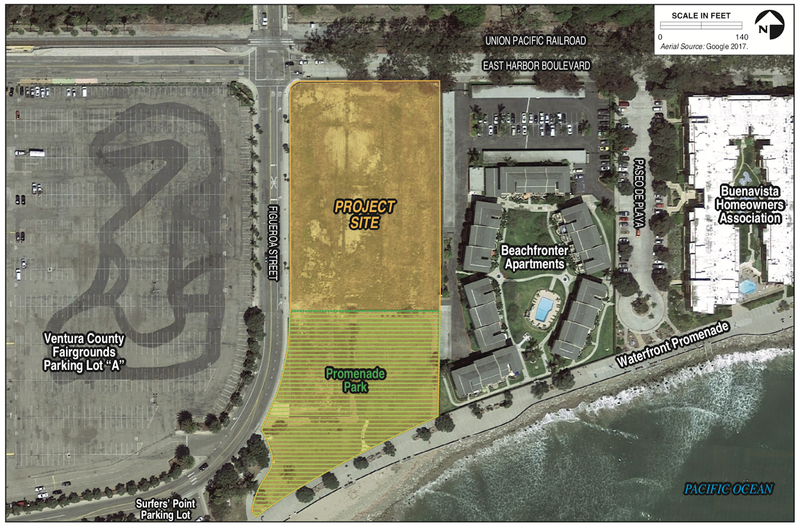 This planned beachfront development is entirely dependent upon Ventura's aging infrastructure for protection from future storm events. Earlier comments are on this blog here. On August 27, 2018, the California Natural Resources Agency released California’s Fourth Climate Change Assessment. The goal of these assessments is to "provide the scientific foundation for understanding climate-related vulnerability at the local scale and informing resilience actions. The Climate Change Assessments directly inform State policies, plans, programs, and guidance to promote effective and integrated action to safeguard California from climate change." 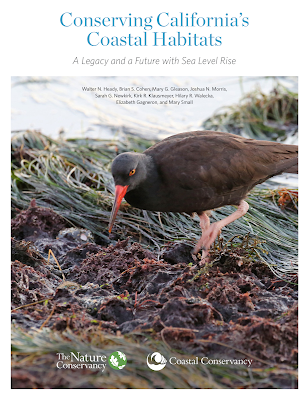 The Key Findings summarize the impacts on people, infrastructure, and natural systems, and "provides critical information that will enable more ambitious efforts to support a climate-resilient California." The Fourth Assessment included a Coast and Ocean Summary Report for the first time; this report synthesizes the latest research... about the challenges facing our coast and ocean because of climate change and what actions we can take to increase their resilience. The Fourth Assessment study found that sea-level rise has become the dominant concern for coastal managers, and most also face funding and financing barriers. "At Surfers Point in Ventura County, officials turned an eroding parking lot and collapsing bike path into a cobble beach backed by vegetated dune. 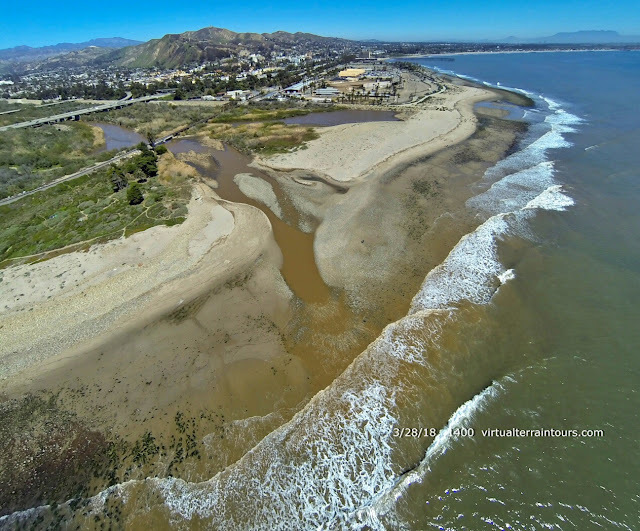 It has fended off erosion, widened the beach and become the most visited beach in Ventura County, the report said. 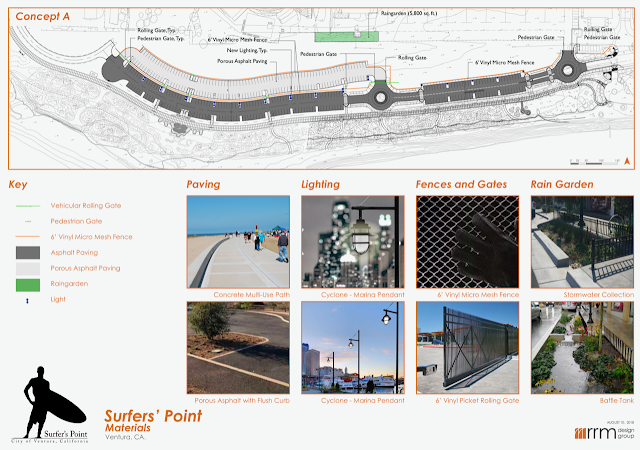 During high wave conditions in the winter of 2015-16, no damage occurred at the project site: Wave run-up reached the bike path only where dunes were absent. Other parts of the local shorelines were not so lucky: Ventura Pier was damaged in the storm and the Pierpoint neighborhood suffered inundation, the report said." After a long series of studies and meetings, the Mandalay power plant is being removed from the Ventura County coast. After more than 50 years of operation, State policy now requires elimination of the plant's outdated "once though cooling" system to prevent impacts to marine life. Energy company NRG sought to build a new plant in it's place. 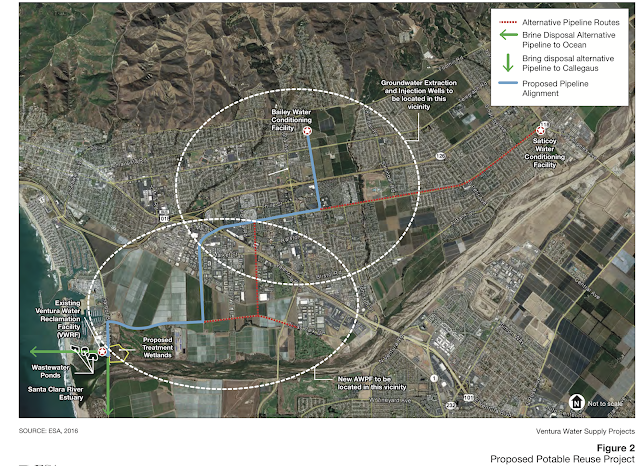 The City of Oxnard and local stakeholders strongly opposed reconstruction of a new gas fired power plant, citing the impacts of air pollution on downwind disadvantaged communities. As the California Public Utilities Commission reviewed the application, the LA Times reported that the State was grappling with an excess of renewable solar energy. 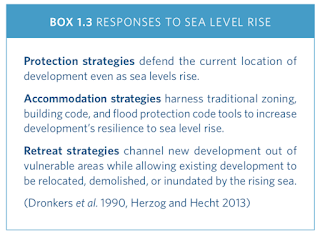 Other studies illuminated the vulnerability of the coastal site to future flooding. So when it seemed that the California Public Utilities Commission was not going to approve the new facility, and SCE did not renew a contract to buy the energy, the current company NRG and its subsidiary GenOn said the three facilities at the Mandalay Generating Station will cease operations by Dec. 31, 2017. For decades the power plant pumped water from the "Edison Canal" and Channel Islands Harbor, discharging onto the beach. Although cessation of this pumping will greatly benefit ocean waters, one potentially unintended consequence will be reduced circulation in the backwaters of the harbor. During the heatwave in July, harbor residents noticed degraded water quality, and sounded the alarm. Meetings were held, and the City of Oxnard began testing the water and installing aeration systems to combat low dissolved oxygen. Although cessation of the pumps may have played a role in this, water quality has been a long-standing problem in this and other harbors along the California coast. Kiddie Beach remains impaired, and past studies concluded that lack of circulation in the harbor, harbor boating practices, and sewage contamination contribute to unhealthful bacteria levels near the mouth of the harbor. Poor circulation exacerbates this problem in the back channels of the harbor. It is not surprising that recent testing identified problems in the Westport, Harbor Island, and SeaBridge areas. In fact, Surfrider filed comments on the the SeaBridge development project when the City of Oxnard circulated an environmental document on harbor expansion. At the time it was clear that this would create the backwater condition that has finally come to light. 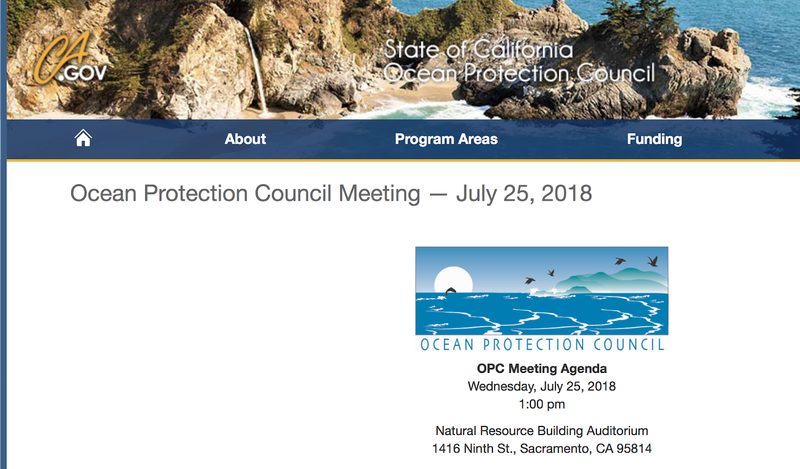 It should be noted that this is not a unique problem, and harbors throughout California frequently experience fish kills due to lowered dissolved oxygen levels. This is usually the result of algae blooms fueled by high nutrient input combined with warm water and poor circulation. Recent examples include Marina Del Rey (2014) and Ventura Harbor (2011). 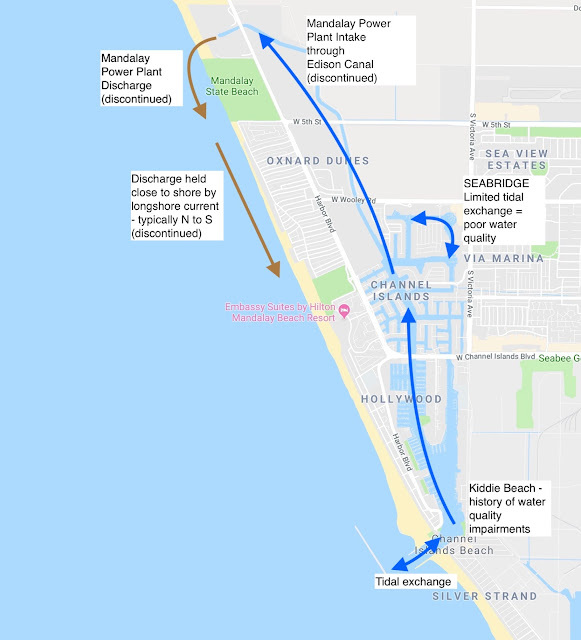 In August 2018, Surfrider wrote a letter to the neighborhood council, and filed comments with the Regional Water Quality Control Board supporting cancellation of the Mandalay NPDES discharge permit. Sources of pollutants entering the harbor should be monitored and solutions developed to curtail or eliminate them. Current water quality rules encourage improved water management practices, but until a community demands it, enforcement alone cannot force the necessary changes. In the meantime, the aeration systems installed by the City of Oxnard have demonstrated viability as a means to mitigate for lowered dissolved oxygen levels. Similar to the sand-moving efforts at Oxnard Shores, this will not solve the root cause of the problem but merely help reduce the impacts of water pollution. Surfrider commends the Channel Islands Community for uniting on this issue. For years the poor water quality associated with the harbor has gone largely unnoticed. The cessation of the power plant pumps may have temporarily exacerbated the problem, but the situation is not new. We encourage the harbor residents to direct their efforts toward source control and mitigation. Residents and boat owners can and should play a role in this process; indeed, success depends on it. This item will be considered by the Regional Water Board at a public hearing, which will be held during the Board’s regularly scheduled September 13, 2018 meeting. The Board meeting will begin at 9:00 A.M. at the Ventura County Government Center Hearing Room, 800 South Victoria Avenue, Ventura, CA. On June 28, 2018, Regional Water Board transmitted the tentative Order which would terminate the waste discharge requirements and NPDES permit for NRG California South LP, Mandalay Generating Station located at 393 North Harbor Boulevard in Oxnard, California. Pursuant to Division 7 of the California Water Code, the Regional Water Board, at a public hearing held on September 13, 2018, reviewed the tentative Order, considered all factors in the case, and adopted Order No. R4-2018-0130. Jun 22, 2018 Why is the water brown at Channel Islands Harbor? This week contractors began field work in the reservoir upsteam of Matilija Dam. 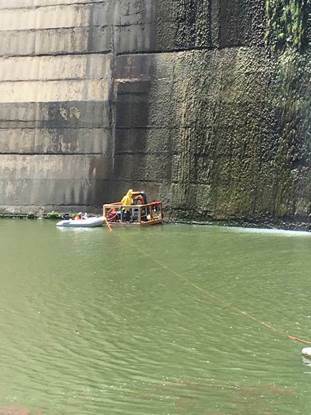 A barge-mounted drilling rig is being used to sample the sediments trapped by the dam to update the work that was completed as part of the Corps of Engineers Feasibility Study. 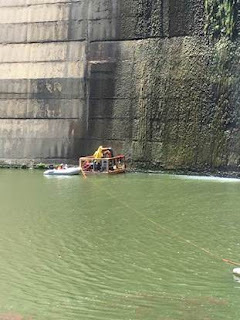 Additional core samples will be collected from the dam itself, in order to assess the current state of the concrete and provide data for the structural analysis of the dam removal project. 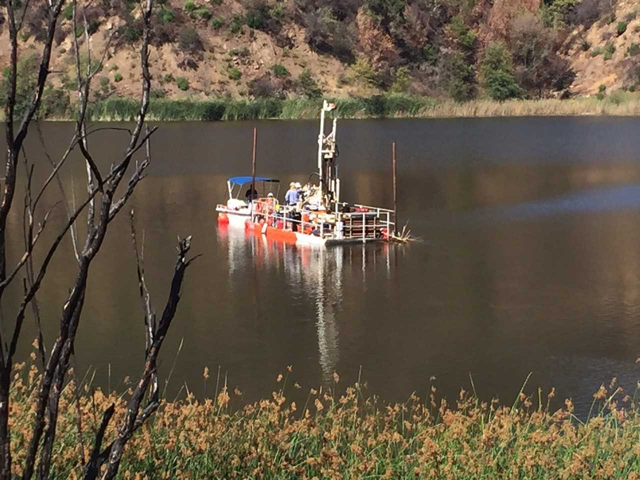 These field studies are the first tasks in the Matilija Dam Removal 65% Planning Design Project funded by the $3.3M California Department of Fish and Wildlife Proposition 1 Grant received in May 2017.
laboratory testing. Sampling and testing shall be performed to screen for the presence of contaminants such as heavy metals and pesticides, and the results shall be compared to earlier test findings by the US Army Corps of Engineers. Previous investigations by the United States Army Corps of Engineers (USACE) identified that the characteristics of the organic materials in the fine sediment upstream of the dam could affect water quality during and following dam removal. 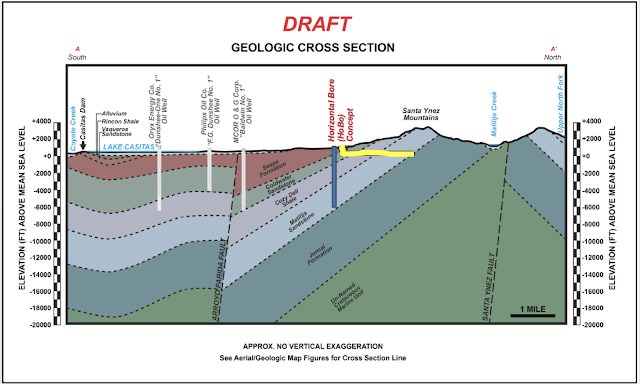 Several borings were abandoned after methane gas was detected and as a result, the full depth of the sediment was not penetrated at those locations. 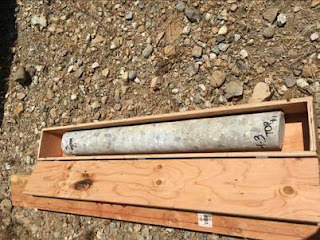 The six borings included in the this scope of work, as indicted above, will be used to characterize the limits of the organic materials as well as collect other geotechnical information (SPT blowcount, grain size distribution and relative quantities, plasticity, shear strength, etc.) related to the sediment to confirm the transport of fine sediment from the reservoir during initial and subsequent flushing events. ...obtain concrete cores from the downstream dam face near the two proposed orifice locations and at 4 to 6 other locations along the upstream face of the dam. The downstream cores shall be obtained from a barge platform in the plunge pool or other means of access. The upstream cores shall be obtained from the same barge platform used for the geotechnical investigations under Task 1.1. Selected samples shall be tested for bulk specific gravity, unconfined compressive strength, splitting tensile strength, and elastic modulus properties. Petrographic analysis and gel fluorescence testing shall also be conducted to assess the presence of Alkali Silica Reaction (ASR) in the concrete. New information has been released on dam safety in Ventura County. 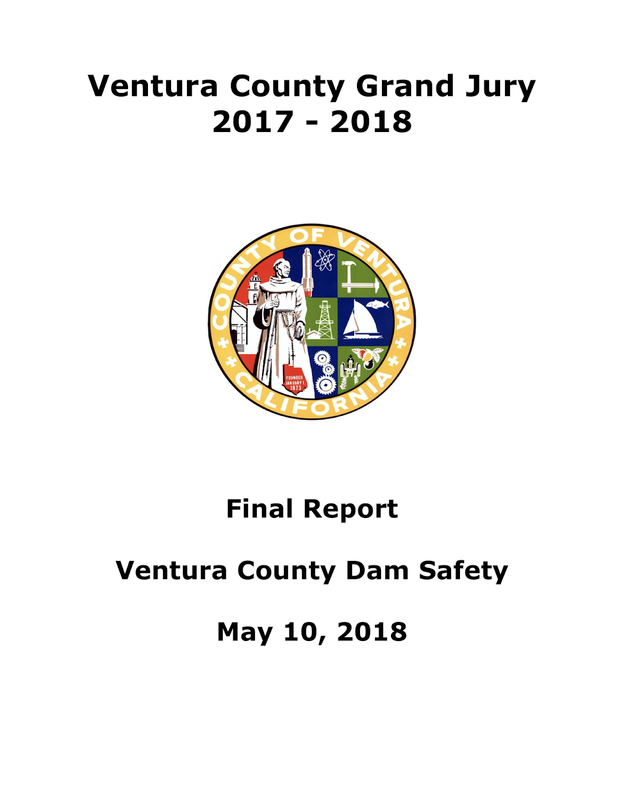 A report compiled by the Ventura County Grand Jury finds that there does not appear to be any effort by the dam owners or the OES to educate the public as to the potential inundation areas, evacuation routes, or what to do in the event of a dam failure. 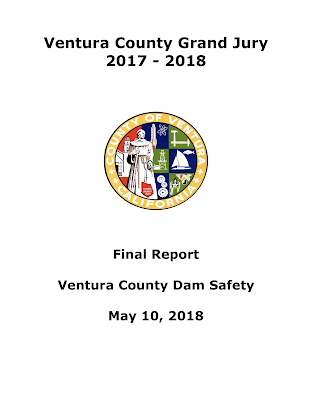 Jury (Grand Jury) investigated the condition of more than 20 dams in or adjoining Ventura County. The Grand Jury found that 14 of these dams could cause significant loss of life and property if they failed. Four of these dams, all under the jurisdiction of the State of California Division of Safety of Dams (DSOD), are identified as having existing or potential deficiencies. The Grand Jury investigated the reasons for the deficiencies and what efforts are being made to correct them. FA-07. The Ventura County Watershed Protection District (VCWPD) owns and operates the Matilija Dam [capacity 3,800 acre-feet], which received a “Poor” rating by the DSOD. The DSOD rating was based on concerns as to the ability of the dam, specifically issues related to the wing walls, to withstand a 7.5 magnitude earthquake. While the analysis did not appear to indicate complete failure, it indicated a likelihood of significant weakening. VCWPD’s subsequent analysis did not indicate the same level of damage. Even so, the VCWPD, with concurrence from DSOD, agrees that removing the upper wing walls could significantly stabilize the dam. For that reason, VCWPD has applied for a $2-million hazard mitigation grant from FEMA to remove the wing walls. 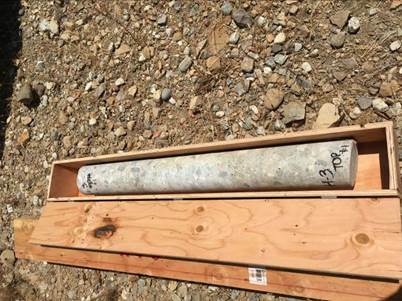 The district is continuing its quarterly monitoring program of the dam and will be taking core samples later this year to ensure that it has up-to-date information as to the dam’s integrity. The Ventura County Grand Jury is calling for tightened oversight of area dams and community education on how to respond to a dam failure after investigating the safety of the critical structures. Ref-08. Matilija Dam Removal and Ecosystem Restoration Project Funding Plan, April 2017. Matilija Dam Design Oversight Group. 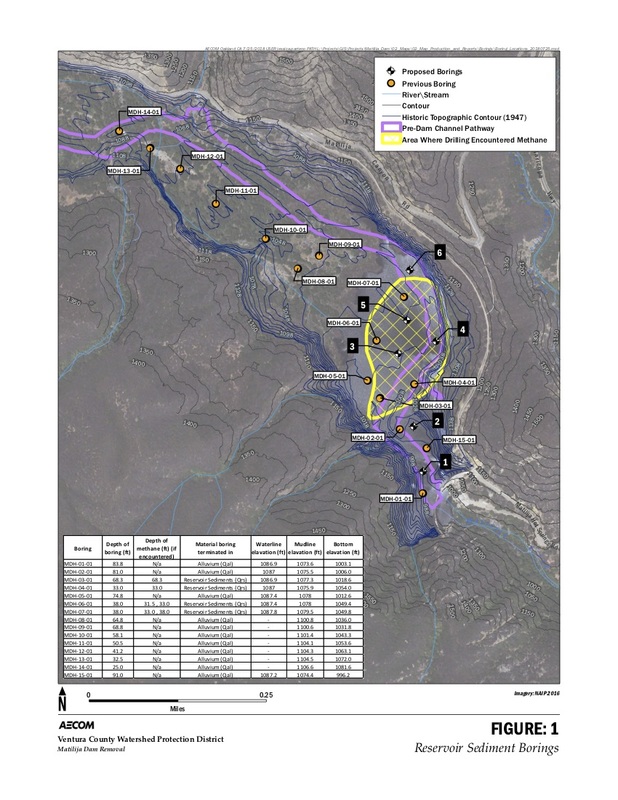 http://dev.matilija- coalition.org/wp-content/uploads/2016/01/Matilija-Funding- Plan_FINAL.pdf. The ongoing drought has water managers and community members paying much closer attention to our water supply. Although the signs of unsustainability have been evident for years, the extended drought, and now the impacts of the Thomas Fire, have brought the issue to the forefront of discussions in the watershed. The significance of this downward trend in water supply is evident. We only received 11" this winter. And although demand has been reduced by up to 30% in some sectors, it is likely that we will see Stage 5 drought declared this year, which would prohibit outdoor irrigation. Sufficient Local Water Supplies. Sufficient local water supplies to allow continued independence from imported water and reliably support ecosystem and human (including urban and agricultural) needs in the watershed now and in the future, through wise water management. The watershed plan lists a variety of potential projects, including stormwater capture, conservation, and reuse strategies. While a few projects have been pursued to date, there is now increased pressure to develop new supply. And although local agencies all endorsed this plan, the goal of independence has lost priority. Local water agencies are working on new supply projects. 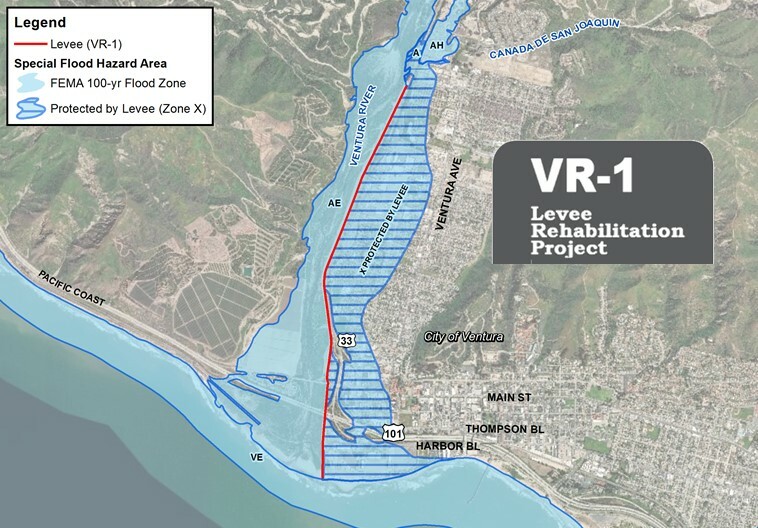 The City of Ventura is pursuing a strategy that includes wastewater recycling, ocean desalination, and connection to State Water. These projects are in the early stages of environmental review, with Notice of Preparation circulated in late 2017 early 2018. The projects would develop new water supplies to augment the City’s water supply portfolio consistent with the City’s recently completed 2017 Comprehensive Water Resources Report (CWRR) and 2015 Urban Water Management Plan (UWMP). Some of these projects also constitute "Diversion Infrastructure Projects" as that term is defined in the Consent Decree, filed with the U.S. Central California District Court February 3, 2012 between the City, Wishtoyo Foundation/Ventura Coastkeeper, and Heal the Bay for the protection of the Santa Clara River Estuary. 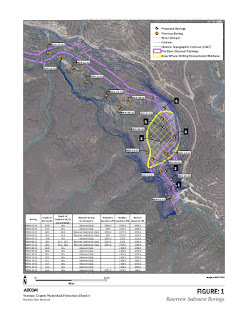 Central to this strategy is the VenturaWaterPure Project which consists of an Advance Water Purification Facility (AWPF), product water conveyance pipeline, and proposed groundwater extraction and injection wells. The project also includes construction of a new concentrate discharge pipeline, with an outfall to the ocean. The Ocean Desalination Project would be sited at the same location as the VenturaWaterPure AWPF. 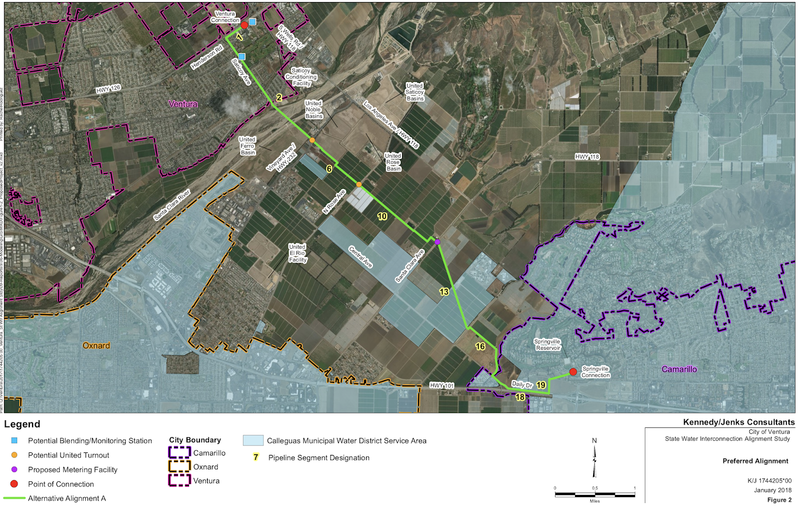 The project would enable delivery of State Water Project (SWP) water by wheeling water through the Metropolitan Water District of Southern California (MWD) and Calleguas Municipal Water District (Calleguas) water systems to the City of Ventura. The connection would also facilitate direct delivery of SWP water to United Water Conservation District (United) and direct or in-lieu1 delivery of SWP water to Casitas Municipal Water District (Casitas). In addition, the interconnection would allow the City to deliver water to Calleguas during an outage of its imported water supplies. The interconnection would be a pipeline used to transport water between Calleguas’ and the City’s distribution systems. 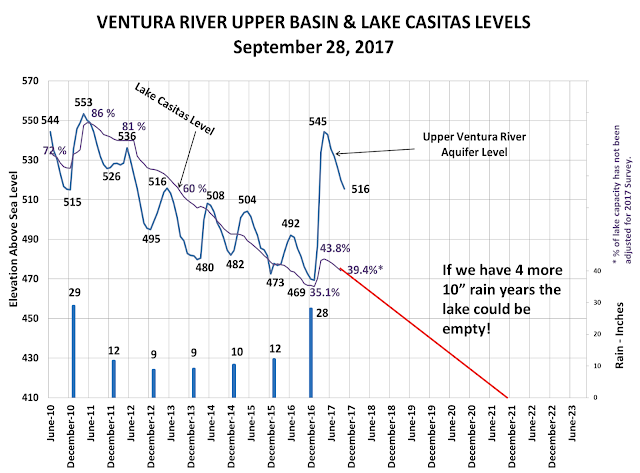 Casitas (CMWD) operates Lake Casitas as surface storage which serves as a primary and backup water supply to all users in the watershed. As illustrated above, the reservoir is approaching all-time low levels. All of these projects are described more detail in the Preliminary Water Security Analysis, Casitas Municipal Water District, Nov 4, 2016. 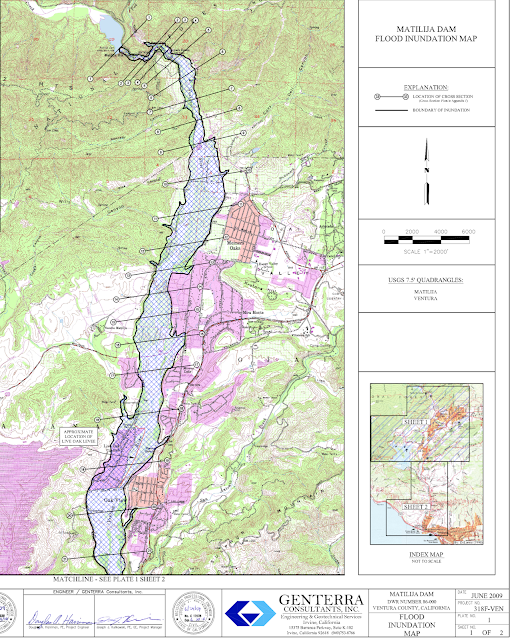 Matilija Formation Horizontal Bores, "HoBo's"
Ojai FLOW: this organization was successful in the effort to gain local control over water supplied to the City of Ojai. CMWD now operates the infrastructure previously owned by Golden State Water. Save Our Water Ventura: Activities of the society and the economy should occur within the limits of the greater environmental system and improve -not weaken - its quality. 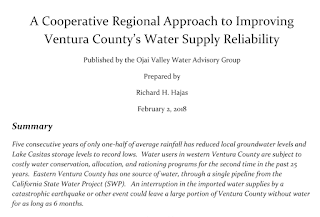 Ojai Valley Water Advisory Group: The purpose of this small 4-person group (Larry Yee, Rosalie Zabilla, Richard Hajas, Peter Thielke) was to analyze the growing water crisis situation in the Ojai Valley brought on by 5 straight years of drought and a seriously low-level Lake Casitas and to explore possible scenarios and solutions. The group released the OVWAG Proposal in February, 2018. 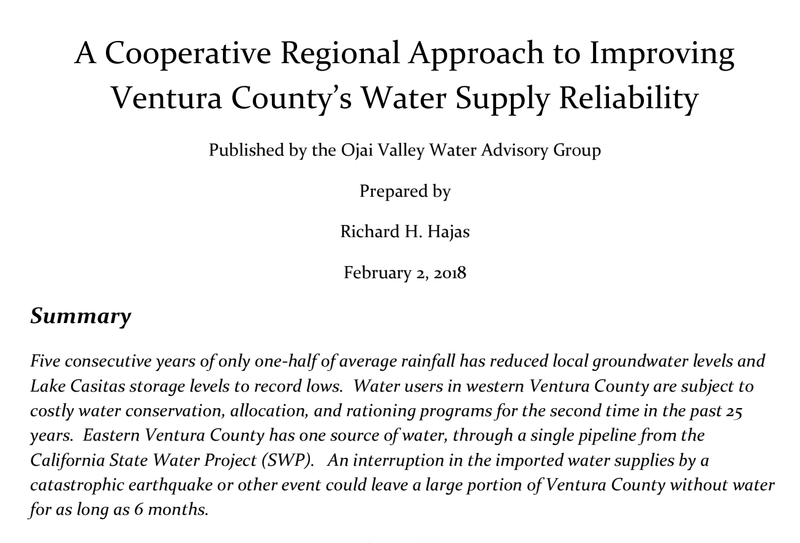 The "Three Sisters" proposal advocates for collaboration between CMWD, Ventura Water, and Calleguas Municipal Water District to increase Ventura County's water supply reliability. The Water Commission shall have the power; and it shall be its duty; to review and make advisory recommendations regarding water rates; water resources infrastructure projects in the 5-year capital improvement program; the integrated water resources management plan; water supply options; the Urban Water Management Plan approval process; a water dedication and in-lieu fee requirement; and other water resource issues. Surfrider Foundation position on local water supply - "Surfrider believes that our community can and should learn to live within the natural limits of our surroundings by optimizing the management of our most precious resource: fresh water." Preliminary Water Security Analysis, Casitas Municipal Water District, Nov 4, 2016. They aren't calling it a "March miracle," but to many of us it felt like it. A fairly steady wet period delivered around 8" of rain to the Ojai Valley, and rescued this year from the record books. Seasonal totals range from 6" in Ventura, to over 11" in Ojai, with Matilija Canyon receiving over 16". This is just a bit less than half the "average" rainfall for our watershed. 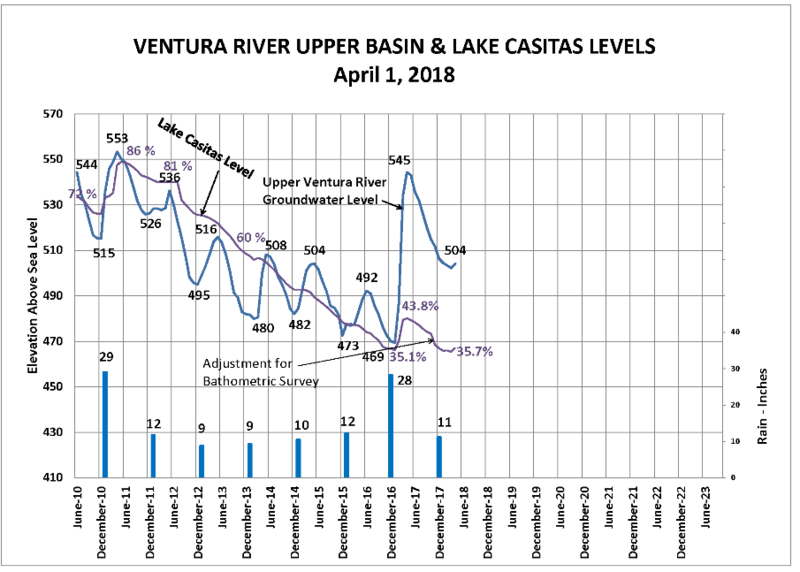 The Ventura River Water District monitors levels in the Upper Ventura River Groundwater basin as well as Lake Casitas. Note that the groundwater (blue line) responds quickly to rainfall compared to the large volume of the reservoir. This graph shows the general downward trend in water storage, which unfortunately was not helped much with this season's rainfall. Water managers are also concerned that the Thomas Fire is impacting supply. Huge volumes of ash and silt eroded from the burned landscape and deposited within the riverbed, possibly hindering infiltration into the underground aquifer. So far this year the blue line shows a relatively small uptick compared with past seasons. The March rains did mobilize a bit more ash, but more noticeably the river has again remained turbid (brown) for an extended period due to high levels of silt eroding from the bare mountainsides. 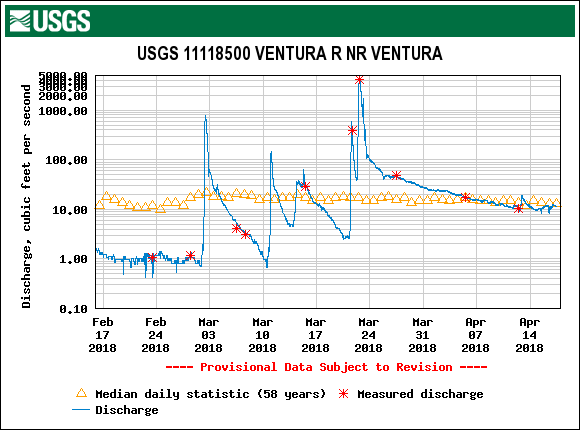 This hydrograph for the month of March (thru April 13) shows flows at Foster Park (green line...8500) and below Matilija Dam (red line...4495). The graph clearly shows storm peaks throughout the month, with the final storm registering around 4000 cfs. This plot also confirms observations that river flows have remained relatively high following the final storm. This may indicate significant changes in the hydrology of the watershed due to the Thomas Fire. On the other hand, USGS data show that flows are now comparable with the historic median. 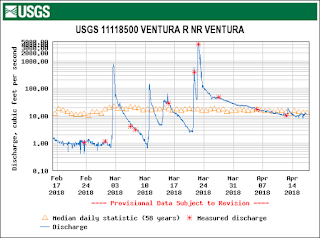 The Upper Ventura River Groundwater Sustainability Agency (UVRGSA) recently commissioned studies to monitor and assess the situation. Finally, this aerial view of the rivermouth also shows silty water flowing into the ocean at Surfers' Point. Not surprisingly, Surfrider Ventura's new Blue Water Task Force and County testing found poor ocean water quality following the rains. But look at that sand! 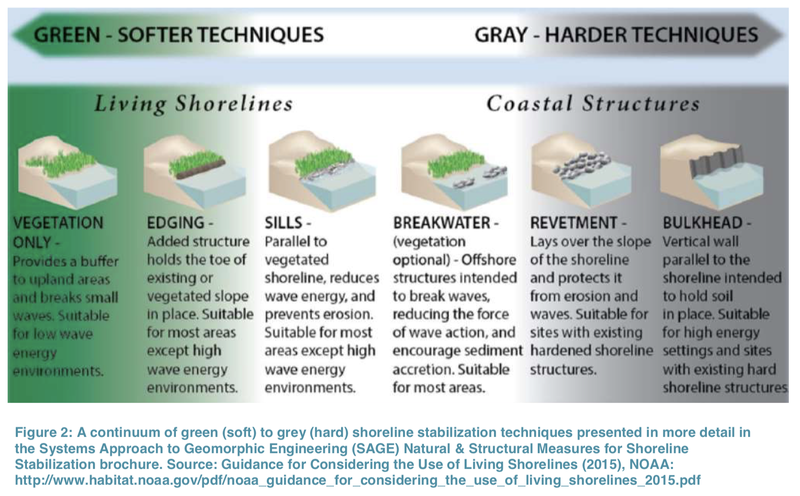 The "Living Shorelines" concept for bay and estuarine management has been gaining momentum as an alternative to traditional coastal engineering. 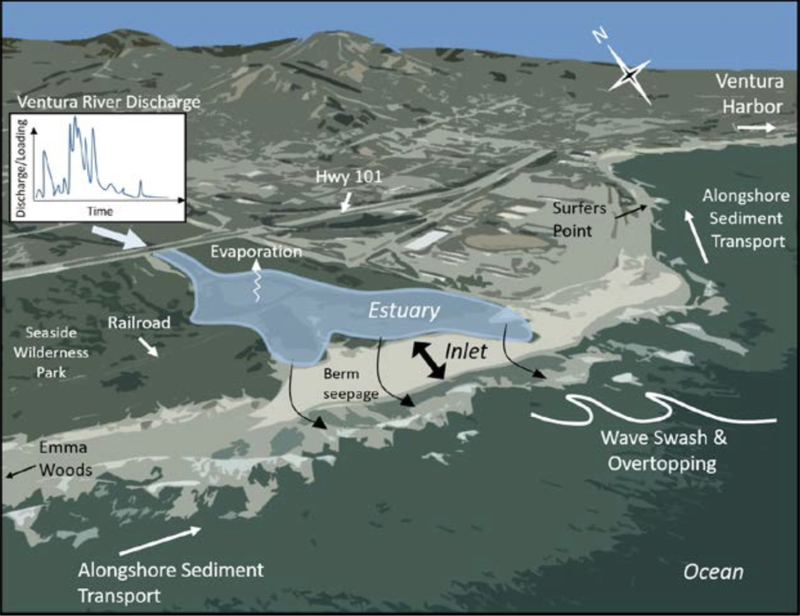 The Surfers' Point Managed Shoreline Retreat project is often cited as a rare application of this approach on a high energy shoreline. 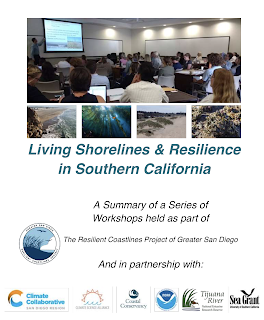 In 2017, the Resilient Coastlines Project led by the San Diego Climate Collaborative "brought together local decision makers and scientists to engage in thoughtful discussion and brainstorming for how to enhance the natural coastal landscape of our region, while building community resilience. Three workshops brought 150 regional leaders together in San Diego, Costa Mesa, and Santa Barbara." "In Southern California, living shoreline projects are largely in the planning, designing, and early construction phases, so there is still much to be learned about the expanding practice. The participants in the Southern California Living Shoreline workshops represent leaders in our region and together they are laying the groundwork for advancing expertise and knowledge about living shorelines." Participants agreed that the term “living shoreline” is not easily defined but is an important concept for not only natural resource managers to understand but for city planners and government officials to embrace as they move forward with community plans. In its most basic form, a living shoreline must provide habitat while physically protecting the shoreline. link to regional habitat recommendations. Living shoreline approaches began on the East Coast, where projects have been demonstrated and tested significantly more than on the West Coast. However, many of these model approaches are not applicable to Southern California because this region experiences high wave energy, seasonal El Nino storm events, and King Tide events. 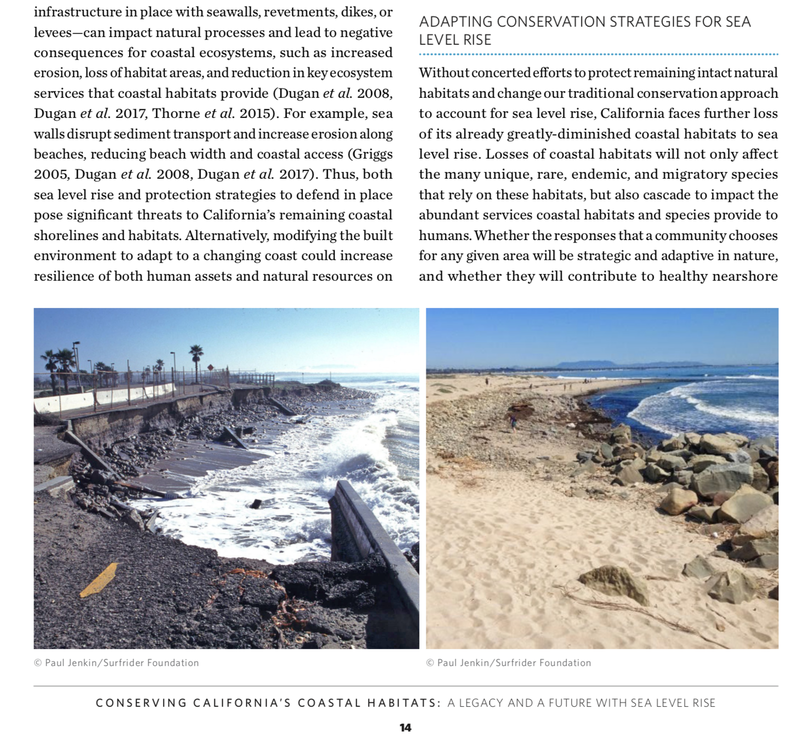 Successful living shoreline approaches also need to consider the uniqueness of Southern California coastal habitats and the fact that its coastal and ocean landscapes are heavily used and developed. Some potentially suitable approaches have recently been designed and tested in Southern California conditions. 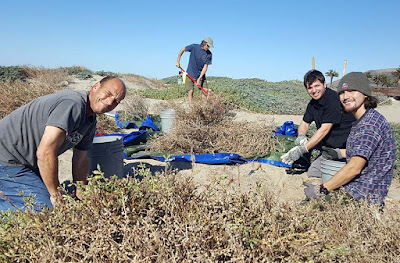 Examples of these early pilot projects include: The Cardiff Dune Restoration Project, the Santa Monica Beach Restoration Project, the San Diego Bay Native Oyster Restoration Project, and Ventura’s Surfers Point. As a living shoreline protects the coastline, natural weather events or seasonal cycles may damage the project site in the short-term but if it’s truly resilient it should be able to bounce back and restore itself to a functioning natural ecosystem. Many participants expressed their idea of an ideal project integrating some form of “retreat” or “relocation” of infrastructure to create space for restoring natural coastal processes that can accommodate changing conditions. 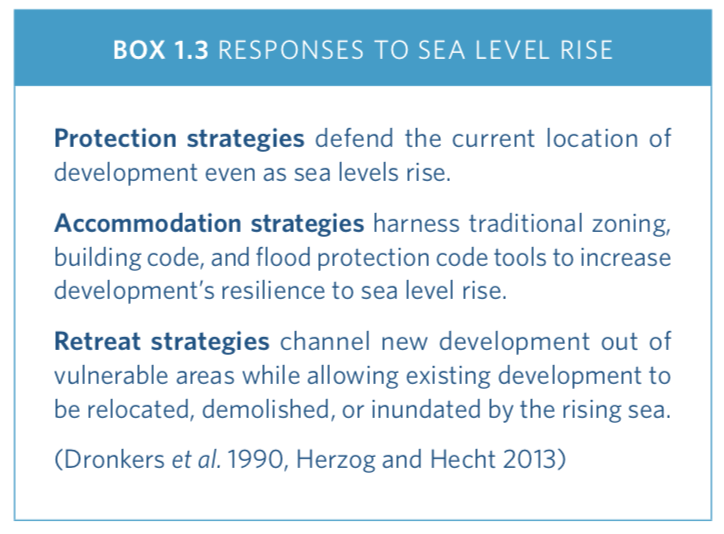 Given the close proximity of development to Southern California shorelines it’s important to keep in mind that a living shoreline doesn’t need to be the final answer to sea level rise but may be a short term or mid-term option within a long-term vision. participants were quick to discuss the importance of designing and monitoring coastal projects in the context of the broader watershed, especially when it comes to sediment management. Projects in the upper watershed (e.g., dams) can have huge implications for how much and what kind of sediment reaches our beaches to naturally replenish the sand supply. Locals and tourists can be involved in monitoring activities through citizen science initiatives, and can even assist with long- term upkeep helping to lower maintenance costs by creating volunteer groups and involving students. Boudreau, D., Engeman, L., & Ross, E. (2018). 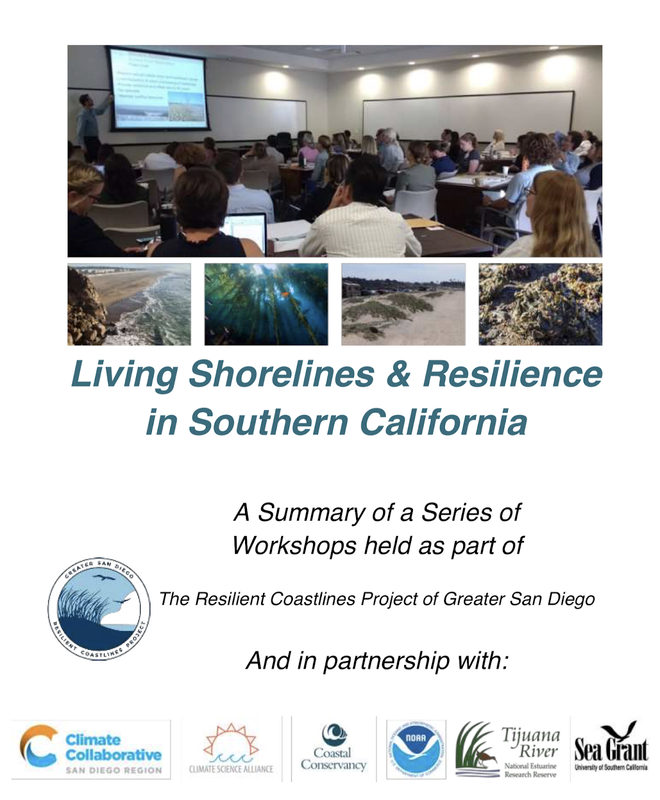 Living Shorelines and Resilience in Southern California: Workshop Series Summary Report. San Diego, CA: Tijuana River National Estuarine Research Reserve; San Diego Regional Climate Collaborative. The Surfers Point Working Group has been assessing grant opportunities and a strategy for moving forward to complete the Managed Retreat project. The group met in June and again in September, 2017. The working group provided an update to the Ventura County Fair Board at their meeting on February 27, 2018. After some discussion, the board voted unanimously to endorse their CEO to provide support to current and future grant applications. 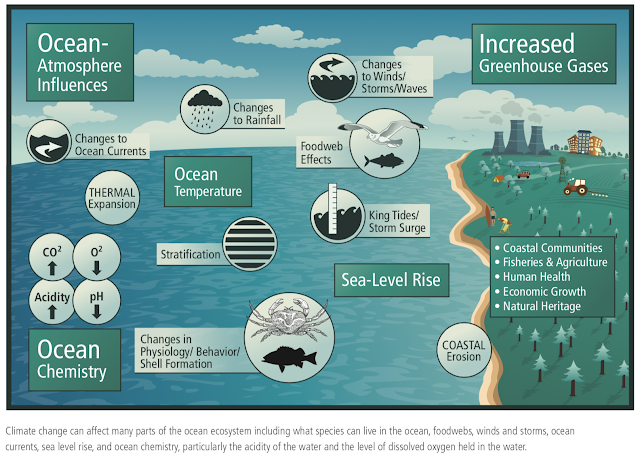 The OPC guidelines identify climate change, ocean pollution prevention, and sea level rise as priorities. In addition to the Priority Areas for funding described in Section 1.5, the OPC has "a strong preference for projects that are: innovative; demonstrate new approaches or solutions to ocean and coastal problems; employ community-based approaches; and/or address important unmet needs or gaps". If successful, this funding will inject $355,000 in consulting services for final design, planning and engineering to deliver a shovel ready project. Additional federal funding is earmarked for the project implementation, and project completion is attainable with matching state and local funds. The City of Ventura and BEACON will be contributing both funding ($50,000 City of Ventura) and in-kind professional and consultant services (City of Ventura and BEACON staff and consultants) equal to at least 25% of the total project budget. 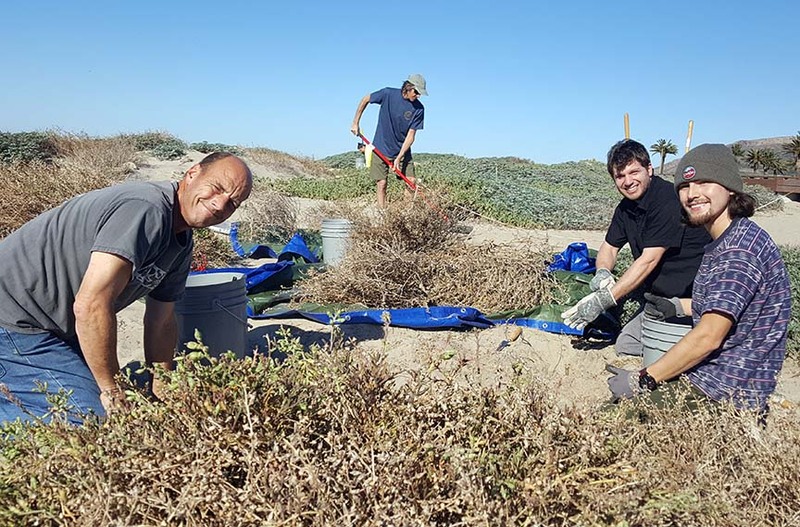 The Surfrider Foundation continues to contribute funding and volunteer time in ongoing dune restoration program in partnership with the city's Volunteer Ventura program. of the Managed Retreat project. Typically these events address non-native plants as they sprout in the springtime. This year's first event was held on Feb 17, with another scheduled for 9 a.m. on Saturday April 7th. Volunteers may sign up here. The Surfers' Point Managed Shoreline Retreat project is one of the most-cited examples of coastal management in the State of California. But this January, the State of Hawaii Office of Planning hosted a managed retreat symposium exploring the feasibility of a managed retreat framework for the State of Hawaii. The symposium included a variety of speakers and participants including a presentation on Surfers' Point. 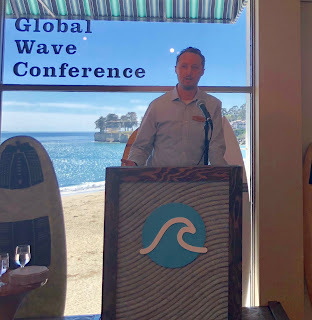 The project was also showcased last week at the 5th Global Wave Conference held in Santa Cruz, California. Consulting engineer Louis White spoke about the project during a session on "Climate Change and Innovation." This session may be viewed here. State of Hawaii, Office of Planning, Managed Retreat Symposium January 11, 2018. 5th Global Wave Conference , Santa Cruz, CA, March 4-7, 2018.